Starting today, April 25, 2013, this year’s annual set of five America the Beautiful uncirculated quarters is available from the United States Mint. Officially dubbed the 2013 America the Beautiful Quarters Uncirculated Coin Set™, this product for collectors is priced at $12.95. This is the fourth year that the uncirculated sets have been available. The United States Mint is producing a total of 56 quarters in the America the Beautiful series. Each one features a reverse side that celebrates a national park or site from each of the 50 states, the District of Columbia and the five U.S. Territories. The program will continue until 2021, debuting five new designs every year. Each quarter is marked on its obverse side with P or D to note its mint of origin. The coins are displayed in a folder with descriptions of each honored site, coin specifications and a Certificate of Authenticity. 2013 America the Beautiful Quarters Uncirculated Sets are available through the United States Mint’s website, on this product page, or by calling 1-800-USA-MINT (872-6468). This set does not have any mintage of household limits as collector demand will determine production quantities. Future sets and related products are also available by subscription via the United States Mint Online Subscription Program found at www.usmint.gov/catalog. The same uncirculated quarters will be offered later this year in the annual 2013 United States Mint Uncirculated Coin Set® for $27.95. In addition to the quarters, this particular set also has uncirculated coins from Denver and Philadelphia of the penny, nickel, dime, half-dollar and the five $1 coins. Its release date is still undetermined. 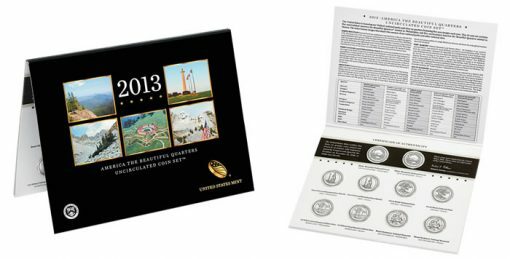 The 2013 United States Mint Proof Set that was released on March 28 for $31.95. Along with the quarters, this set has proof examples of all the other denominations. The annual 2013 United States Mint Silver Proof Set that launches on May 28. It has the same coins as the just described proof set but the quarters, dime and half-dollar are in 90% silver. The clad and silver 2013 America the Beautiful Quarters Proof Sets that debuted in January for $14.95 and 41.95, respectively. Finally, in November, the 2013 America the Beautiful Quarters Circulating Coin Set™ will go on sale for $5.95. It offers ten circulating-quality quarters with five from the Denver Mint and five from the Philadelphia Mint. Keep track of past and newly released products in the news section about quarters.